First time somebody complained to me about their jetlag it was my grand-aunt. I assumed she had a problem with her leg. After more than five years in a transatlantic relationship, "jetlag" has become one of my more frequent answers to the question how I am doing. I would describe it as a desorientation of my inner clock that typically results in sleeping problems despite tiredness, accompanied by headaches, low blood pressure and a generally bad mood. presenting the results of experiments on rat that were subject to an increased daylight period, similar in duration to that on a flight from Central Europe to the East Coast. The rats had previously been on an artificial day-night cycle with 12 hours light and 12 hours darkness. Then their daylight period was increased by 6 hours, followed by a 12 hour night, another 12 hour day and then complete darkness. Among other things, the rats were implanted with EEG electrodes recording their brain activity. The authors study two different sleep phases in this experiment: the so-called Slow-Wave-Sleep and the REM (rapid eye movement sleep). They can be distinguished by brain activity. The sleeping pattern is regulated by a brain region called the suprachiasmatic nucleus responsible for the roughly 24 hour rhythm of living organisms. It consists of two areas, the ventrolateral and dorsomedial part. The ventrolateral part obtains light information from the eye, the dorsomedial part doesn't. Exposing the rats to a longer period of daylight leads to an "enforced desynchronization" of these two regions. The measurements of brain activity show that while the the slow-wave-sleep immediately adjusts after the delay of the next night phase, the REM sleep needed several days to come back in synch with the slow-wave-sleep, indicating that the former is regulated by the ventrolateral, the latter by the dorsomedical suprachiasmic nucleus. In the meantime, the sleep architecture of the rats was messed up. Reading the paper I had been wondering why, after increasing the light-period, the day-night cycle was not continued but instead the rats were put into total darkness while measurements were continued. Horacio de la Iglesia, one of the authors of the paper, was so kind to answer my question and explained that previous research had shown that in such a way the dysynchronization continues to 6-7 days, whereas with a continued day-night cycle the readjustment might happen faster. I find this study really interesting. Of course there are many reasons why this experiment on rats doesn't too accurately describe what happens in the human brain when jetlagged, but I think chances are good the basic insights about the messed-up sleep patterns are transferable. There are many further questions that spring into mind, for example one would like to know if the desynchronization lasts longer if instead of increasing the daylight period, the nighttime period is decreased. That's because I find it typically much harder to adjust after an eastward than after a westward flight. After reading the paper I believe it might be because in this case I tend to sleep into the day too long, missing many hours of sunlight which delays adjustment further. One would also like to know how the time needed for adjustment relates to the phase shift in the day-night cycle. Something else I learned from this paper is that "sacrificing" (in this case the rat) is an euphemism for "chopping off their head and removing their brains". Eva played with Google trends and reports that nobody cares about math in the summer holidays. You can check your English spelling with the Times Online Spelling Bee. Turns out my spelling is pretty good, just that I simply don't understand or don't know on the average one out of 15 words. Very embarrassing. I blame it on the British English. I recently came across Forvo.com, a site that offers recorded pronunciations of millions of words in their original language. Since the question came up in an earlier post, here is how Sabine and Stefan is pronounced. NewScientist reports on the Photic Sneeze effect "anything between 1 in 10 and 1 in 3 of us might be affected." A poll among the readers of this blog found that more than 60% sneeze when looking into bright sunlight after having adapted to the dark. The next Scibarcamp will take place in Toronto in two weeks. If you're in the area, why not drop in? It's bound to be interesting. I hate to break the news on you, but it's not the stork who brings the little babies. No, for about the price of a used car you can buy them frozen in a clinic near Toronto. Then you put them in your mommies tummy where they unfreeze and grow until they get too large... and that's where the story gets a bit unpleasant, but don't worry coz intelligent people are working on this. The previously mentioned upcoming PI conference "The Economic Crisis and its Implications for The Science of Economics" now has a schedule to offer. Looks like it's going to be tremendously interesting! Quick, don't think: What's typically German? After last month's poll "What's typically American" lead to results that were as amusing as to the point, I am curious now what you think is typically German? Name five things, no names, no places. I will update the following list and count what's been repeated. Since most of our readers are not German, feel free to add an explanation if you think it necessary. Limits no longer apply (Ende aller Streckenverbote): A streetsign signaling the end of all speed- and other limits, announcing Autobahn freedom. The greatest thing about Germany whatsoever. Garden dwarfs (Gartenzwerge): Are little figures of clay (or plastic) one finds between tomatoes or primroses, typically in front gardens and allotments. The little guys, usually wearing red caps and engaging in some sort of outdoor work like digging or sowing seeds, are the highlights of German neatness. Fachwerk: If you've seen any pictures from Germany you've seen Fachwerk. It's a way of constructing houses in which a skeleton of wooden beams is later filled in with bricks or some sort of bond. It was very popular until the 19th century. Most old city centers in Germany still feature these houses. Bread with a hard crust: Even after more than five years it's a mystery how somebody can eat, not to mention make, these wiggly wobbly bakeries one finds in the rest of the world. Bandwurmwörter: Nouns created by joining several words, a peculiarity of the German language. Donaudampfschiffkapitän, Schleifenquantengravitation, Rhabarberbarbarabarbarenbar. Zukunftsangst: looking fearfully into the future especially in times when everything is going smoothly, but feeling the better the harder it gets. Resilience: the ability to withstand catastrophes on a national level and come out of it better than before. Compulsive efficiency: (at least in old school professionals) - if you want to torture a German, just make him look at a complete moron messing around with something he could do way better. Yes, but are you a prime-number? I have a file number with the German Science Foundation, and an NSF ID. I have an username for the arXiv and a referee ID for PRD. I have a membership number for the APS and the DPG. I have not one, but three social security numbers. Likewise, I have three driver's license numbers. I have account numbers for the electricity company and for the phone company. I have several phone and fax numbers. I have credit card, swift and IBAN numbers, customer numbers, a passport number, a CAA member ID, frequent flyer numbers, health plan contract numbers, and insurance numbers. If you laid all of these numbers end to end, you'd get something close to the US financial deficit or so. As far as I am concerned, everybody should get an universal ID number at birth. Period. It could be used as a phone number, as a webaddress, as a passport number. Just imagine that: newborns wouldn't get a wristband saying "Hello, my name is Desiree" but "Hey, I'm C3POR2D3X2PI." Cute! You can add that to my ideas how to improve the world. But more seriously, for some while there's been talk about establishing a unique Researcher ID that would make a lot of this multiplicity in user- and file-numbers unnecessary, and also cure the problem of correctly identifying researcher's contributions if they have a common last name, or if they have changed their name. Chad had a poll yesterday about the recurring problem of correctly identifying an author. Martin Fenner has a good summary post on the Researcher ID, and he is also polling people for their opinions. I previously commented in my post The Name Game that as much as I might be cursing my name (the full version in my passport is 30 letters long) at least I don't know anybody who shares it, and I usually don't even have to use initials. Stefan however, shares his name, first and last, with a Stefan Scherer from the University of Mainz who is also a Physicist. Not only is Mainz quite close to Frankfurt, the guy is also about the same age and works on an (at least peripherally) related topic. This has occasionally created some confusions. Thus, as far as I am concerned, having a unique Researcher ID it is an excellent idea and one that I'd like to see implemented rather sooner than later. It might however raise some unexpected questions. For example, who can apply for a researcher ID? Are there any criteria? Is there an age limit? Can I get a number for my unborn children? And more importantly, can I customize my number? Because, you see, I would really like to be a prime-number. Increasingly more often, I get emails from graduate students sending their CV and research interests, explaining they are looking for somebody to work with. Most of these emails seem to come from India or China. Usually, the student explains their interest in a topic that with high probability I have never worked on, and their inquiries inevitably start with "Dear Sir". The first couple of times this happened, I took the time to write back they should please apply through the website like everybody else and good luck. These days I just delete such emails. I am trying to understand the situation these students must be in, writing to complete strangers in the hope to become part of the international research community, but still I have little sympathy for such mass emails. Why should I take the time to read somebody's CV if that somebody didn't even take enough time to figure I'm not a Sir. Another type of emails I seem to receive more often the longer I managed to stick around are questions for advice. Usually high school students, and more often from Germany than not, they will ask what studying physics is like in reality, what it takes to become a physicist, what their chances are. I try my best to be answer their questions, but I honestly don't think I can give meaningful advice to people I don't even know. Last week, I got an email from somebody explaining his talent seems to be more in the languages, but his interest more in physics, and what I think how relevant talent is for success in physics. I replied without hesitation that interest and the ability for self-motivation is more important than talent, because the latter can be replaced to a large extend by hard work, whereas the former is a prerequisite for everything. It occurred to me later though that this reply comes from somebody who never really had to work much for maths and physics at school, so that's easy to say for me. I have also met the occasional case of somebody who has been dedicated to physics and invested a lot of time and effort into learning, but just didn't get the most basic things straight. However, I believe many people are actually pretty bad in knowing where their talents are, especially while still in their teenage years, and school performance in particular isn't very predictive. Doing research simply is a completely different story. You won't find out until you have tried, and if physics is where your interests are, you definitely should try. I for my part was never very good in English. But then, how excited can you get about endless interpretations of George Orwell's 1984 and essays about the capital punishment in the USA. Ten years later, friends and relatives abuse me as a living English-German dictionary. For several years, I have avoided to write about The Issue of women in physics on this blog. Frankly speaking, I have the impression it's sufficiently talked about elsewhere and that fruitlessly already, so why add to the noise. But besides this, despite being one of these women in physics, and despite finding the lack of women in the field depressing, it's not a topic I am tremendously interested in discussing. Given a choice, I'd rather talk physics. As things are however, I was invited to the upcoming APS meeting in Denver to speak in a session on "Women and Minorities in Gravity: Science and Career Paths." And since I have somewhat of a bad conscience for never having been at never any APS meeting, not to mention never having been of any use for The Issue, I thought I should go. Now that the meeting is coming closer, I wonder what I know about women and minorities in physics (not sure what "in gravity" is supposed to mean). And their career paths. Or absence thereof. And as if that wasn't enough already, I further learned that the purpose of this session is to bring together three speakers from different types of institutions: research university, teaching-oriented institution, and pure research institution. So I am afraid I'll be representing the pure research institutions. Now I do of course have a personal perspective on The Issue, but I am always afraid I don't represent very well one of the standard positions, even less so that of pure research institutions specifically. People seem to assume if you're a women in science you need to have an opinion. I have however never found it a big deal spending my worklife mostly among men. I like men. I get along with them quite well. They seem to get along with me. Maybe having three brothers has helped in this regard. I liked climbing on trees. I prefer sneakers over high heels. Maybe I'm just not the girly type. Who knows. It is somewhat of a mystery to me why there are still people in this world discussing something like a "scientific ability" of women, as if that was a term that could be defined in any sensible way, or if it was defined, be of any relevance for scientific progress. It seems redundant to say in the 21st century but I feel like I have to spell it out explicitly: women are as capable as men are of being scientists. It might well be that women and men have an evolutionary developed predisposition to be interested in different topics which also reflects in their job preferences. And since that might be the case, I don't see why the composition should be fifty-fifty, neither for physicists, nor nannies, truck-drivers, or secretaries. But there are many reasons to believe that the present female to male ratio in physics doesn't even remotely represent where the natural ratio would be, there are too few women. And though there are many factors that play into this, two of them are most relevant. The first is a chicken and egg problem. If there are few women, few will follow. This has less to do with the often called-upon lack of "role models" for girls, but more with the awkwardness of being the odd one out. Even after all these years, coming into a room with some dozen men as the only one wearing a dress strikes me as a completely unnatural situation. If I laugh, I hear my voice fluttering an octave higher than everybody elses. It's not so much that it bothers me, it just feels like a relic of medieval times. The second point is the hostility of the work environment for family planning. Nowadays, even if you are lucky and eventually make it onto a permanent position, chances are you'll be in your late thirties already. Until then, you will have to jump from one short-term contract to the next and move around the world. And while this isn't a great situation for anybody, I believe women are (on average, always on average!) less inclined to take crap for such a long time and draw consequences earlier. The price to pay is just simply too high. As a result, the longer it takes, the less women will remain. There are lots of other points one could raise. The most often discussed one is certainly prejudices against women. But luckily, the men who grew up with these are simply dying out, at least in the Western Civilizations, so I am confident this problem will resolve by itself. The only prejudices I had to face myself were, ironically, based on support I obtained through programs specifically meant for women in science and engineering. That probably explains why I am not usually overenthusiastic about many initiatives to help alleviate The Issue for they can blacklash. Remains to say catching childrens' interest in early times makes a big difference, so I believe this is one of the most important points to tackle. And if you are a women and considering to become a physicist, let no one tell you what you're supposed to be interested in but find out yourself. I guess I could summarize my opinion on The Issue as: Embrace the differences. PS: I used to think the registration fee for the meetings of the German Physical Society was quite high. They want € 60 per day - and that's already the reduced fee for members. The APS wants a stunning $235 for a single day. However, during the last decades, methods developed in condensed matter physics and statistical mechanics have been applied successfully to financial, economic and social systems, from the analysis of financial data and nonlinear market dynamics to the emergence of traffic jams and the outbreak of cooperation among success-driven individuals (a phenomenon you can witness on every physics workshop. The disease is in many instances short-lived and victims recover quickly when back in their home office). Thus, at the Spring Meeting of the German Physical Society (DPG) that we visited some weeks ago in Dresden was discussed, alongside more traditional topics such as semiconductor physics and vacuum science (pumps, is all I say, pumps! ), the physics of socio-economic systems. Heuer et al's work* shows that during a whole season of the Bundesliga the quality of a team can be characterized by a single fitness value that can be estimated from the league table. They then examined the question how important fluctuations of the team fitness around its average value are. Surprisingly, the effect of fitness fluctuations is very small. Another question that comes to mind is given the average outcome of a match, what is the probability for a specific result? In contrast to a previously suggested interpretations, Heuer et al find the number of goals per team in a match can be extremely well described by a simple Poisson process (for up to 8 goals). Altogether, soccer turns out to be a surprisingly simple match with respect to its statistical properties. Entering the building in Dresden where the conference was held, it was impossible not to notice the lack of women. Men, men, men, everywhere - except behind the registration desk obviously. And while women are typically underrepresented at almost all conferences in physics, we had the impression condensed matter is a particularly severe case (data, anybody?). Maybe that explains the attendants' fascination with soccer. Anyway, Bee's talk was in the same session, so we profited from the audience the earlier talks had attracted. For a German report on this talk see Jan Lublinski's article Mythen und Zufälle. * Andreas Heuer, Oliver Rubner: Fitness, chance, and myths: an objective view on soccer results (arXiv:0803.0614v4 [physics.data-an]). 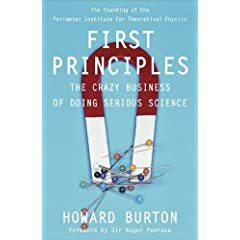 Last weekend, I read Howard Burton's just published book "First Principles: The Crazy Business of Doing Serious Science". Howard Burton was the founding executive director of Perimeter Institute. He left in May 2007 under somewhat mysterious circumstances, according to the press release to "seek new challenges". He was replaced after a period of general confusion by our 'Interim Director' Robert Myers. Last year in May, the search for a new director was completed. As you know, Neil Turok is now director of Perimeter Institute. The book is probably more interesting if you know some of the people involved, but besides this it conveys authentically and passionately the fascination, joy and importance of theoretical physics. Overall recommendable. If this was an Amazon review, I'd give 5 stars. Speaking of Amazon, their website just informed me that customers who bought related items also bought "Lethal Legacy: A Novel by Linda Fairstein." PS: I messed up my order and accidentally bought two copies. You can have the second one for $10 + postage, US/Canada only, send email to sabine[at]perimeterinstitute.ca, it's a brand new copy. PPS: The book is gone. Pictures taken 2 hours ago in the PI parking lot. Physicsworld has an interesting article "In search of the black swans" by Mark Buchanan who ponders the question whether the current research environment for scientists is optimal for knowledge discovery. It quotes Geoffrey West (currently president of the Santa Fe Institute) in praise of interdisciplinarity, Eric Weinstein (who attended our last year's conference on Science in the 21st Century, talk at PIRSA: 08090036) suggesting that scientists should put their money where their mouth is, and Lee Smolin who explains tirelessly that science needs more valley crossers and more risk-taking. As I have argued many times - on this blog (eg here, here and here) and elsewhere - all of these suggestions are almost certain to fail. They sound nice and are meant well, but though today we might call for more interdisciplinarity or more risk-taking, tomorrow we'll have to much of it. Who is going to decide how much is enough? The only way to solve the problem is to allow the system to dynamically reach a balance. I am thus quite sympathetic to Eric's idea which wouldn't fix any percentages but allow some sort of self-organization, just that I don't think monetary incentives are a cure for every problem, and in particular in academia are more likely to cause additional problems. PI's former director Howard Burton published his book on The Crazy Business of Doing Serious Science. I haven't read it, so don't ask. Interactions.org is re-launching the quantum diaries. The original quantum diaries were launched in celebration of the 2005 year of physics and are basically a group blog documenting the lives of physicists. I find the design of the website very well done, and to my eyes' relief it's entirely ad-free. PBS will be airing "400 years of the Telescope" on April 10 to celebrate the International Year of Astronomy. More information on the program here, and photos here. Quantum Gravity in GRB 080916C ? Abstract: Gamma-ray bursts (GRBs) are highly energetic explosions signaling the death of massive stars in distant galaxies. The Gamma-ray Burst Monitor and Large Area Telescope onboard the Fermi Observatory together record GRBs over a broad energy range spanning about 7 decades of gammaray energy. In September 2008, Fermi observed the exceptionally luminous GRB 080916C, with the largest apparent energy release yet measured. The high-energy gamma rays are observed to start later and persist longer than the lower energy photons. A simple spectral form fits the entire GRB spectrum, providing strong constraints on emission models. The known distance of the burst enables placing lower limits on the bulk Lorentz factor of the outflow and on the quantum gravity mass. The article presents details about the gamma ray burst 080916C observed on Sep 16 2008 with the recently launched Fermi satellite (formerly GLAST). Follow-up x-ray and optical observations measured a redshift of z approx 4.35. They have estimated an enormous energy release of ~4.9 times the solar mass, suggesting that the outflow was directed and occurred only into a narrow jet. The burst covered many orders of magnitude in energy, with the highest detected photon being at approx 13 GeV. The interesting thing is that the higher energetic photons seem to be arriving later, with the MeV band peaking some seconds after the keV band, and the 13 GeV photon arriving approx 16.5 seconds after the onset of the burst. The article discusses various astrophysical reasons for this delay, such as spatially distinct regions of origin, a delay of high energetic photons through not well understood opacity properties of the source, or additional time needed to accelerate protons or ions sufficiently. An alternative explanation they investigate is that the delay is due to an energy dependent speed of light caused by Planck-scale corrections to the dispersion relation, which could be a signature for quantum gravitational effects. With the assumption that the delay is entirely explained by astrophysical effects, they obtain a lower limit on the scale of quantum gravity, that is MQG > 1.3 x 1018GeV. Note that this is about one order of magnitude smaller than the Planck scale. I would have found it more useful to think about it the other way round: if the delay is not caused by astrophysical effects but entirely by quantum gravitational effects, the scale must be below this limit to reproduce the observed delay. Since the scale is one order of magnitude below what one would have expected and thus the effect quite strong, I would then be concerned should this effect be due to a modified dispersion of photons it should already have been observed previously, for example in MAGIC's observation of a gamma ray flare in 2007. In addition to this one has to keep in mind that one photon doesn't make a particularly great statistic. This gamma ray burst seems to be quite unusual in its luminosity anyway and an astrophysical origin of the delay is a more conservative explanation. To make a case for quantum gravity, much more data would be needed, in particular one would need to establish a dependence of the delay on the distance. If it is a quantum gravitational effect, the delay should increase with increasing distance. If the delay is of astrophysical origin, the delay should be independent of the distance. Today on the arXiv: Steven Goldman from the University of New Pressburg, WI, proposes in his groundbreaking paper "iBranes in P-disks" that our universe may be a memory chip in a higher-dimensional iPod. One observable consequence would be a fundamental limit to the amount of information in our world. He concludes it is thus highly recommendable to break down information-heavy communication into tweets, and - as Sean Carroll extrapolated - prepare to upgrade from Twitter to Bitter. Slashpot.com reports that climate scientists have found the average human body temperature has increased by 0.4 °C since the fall of the Soviet Union and we should all cool down to avoid further glacier melting. The island of Maui is now offering the ultimate Lisi-Cruise, including a three-day crash course on how to surf like a theoretical physicist and a visit of all the roots of E8.